Terrible speeds from web interface and third party programs. Now it's 700kB via page and < 200kB via official OSX app ... still not usable. If you can help me fix that, I'll purchase 10TB plan even today! I never see more than 0.3MB/s download. 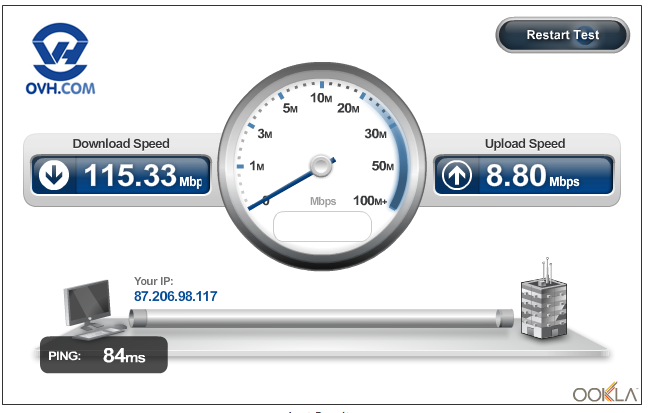 Today I'm getting more reasonable speed around 1MB /s and 2MB/s which is not bad. I've been using hubiC for the last couple of days. I've used it on different dedicated server (one of them also a Kimsufi) and VPS. It's very slow. Last events: [4/18/2015 6:02:10 AM|Info] Click on this icon to access your hubiC. I mean, if this is not slow I don't what it is. I've used also different tools: official Linux application, hubiCfuse, duplicity (+pyrax). How come some people have 25 Mbyte/s and others have 100 Kbyte/s? I have 50 gigabytes free and at a speed of descent ridiculous and hired 10T . thinking that speed into paying customers would be better. If this changes I will go to the company. No matter what I use, whether its a gigabit home connection, an OVH dedi, or my home connection, I can never get above ~3Mb/s from my hubic account. I can download from my Kimsufi server located in one of the French datacenters at full speed, but downloading from hubic is terribly slow. I read there is a 10Mb/s limit in the ToS, which is just silly to begin with, but I can't even get to that speed anywhere. This service is practically unusable with a 10Mb/s UL/DL cap, even for paying customers. Please consider changing this policy to reflect at least common home speeds of 30-50Mb/s, but preferably remove the limit.